KOHALPUR, August 27: Recent floods inundated many parts of the tarai region and left many people utterly helpless. Among them, one of the worst affected communities is the squatters. The floods have added more to their misery. 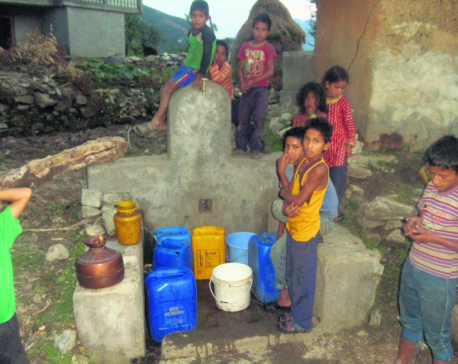 Apart from other inconveniences, the squatters are facing acute shortage of drinking water. The flood has inundated their existing source of water with residue and polluted it. Squatters of Kohalpur, Baijnath, Janaki Rural Municipality and Nepalgunj Sub-Metropolitan City are compelled to drink the same polluted water. The water sources have been occupied with mud, cements, sewage and even feces. Squatters have been long using common wells and hand pumps for water. Incessant heavy rainfall had already adulterated their drinking water sources before the flood worsened it. According to these squatters, when they fetch water nowadays they get plastics, leaves, mud in it. As it is not possible to cook their meals and do other jobs without water, they have no other option rather than using this polluted water. This has been a common problem of slum dwellers in various places of Banke and Bardiya districts. Shushila Tharu of Nayabasti, Kohalpur-11, laments that her family are drinking the contaminated water since few days even after knowing that its harmful for their health. “The water has been polluted and we know that it cannot be used for drinking, but we don’t have any other options,” Sushila said. Floods that inundated these areas in the past weeks not only submerged sources of drinking water but also polluted the water sources. Though, locals have been filtering the water by tying a piece of cloth on the tip of the hand pump, it has been barely helping them to purify the water to a level which would be safe for drinking. The flood has sipped into the water level underground has polluted to such an extent that the water’s color has changed to yellowish. Every year, squatter settlements in Nayabasti, Driver Tole, Sirjananagar, Pragatinagar, Buspark, Nepalgunj Sub-metropolitan city 23, Manikapur, Nayabasti, among others are inundated by flood and are forced to drink impure water. After spending weeks outside of their homes and makeshift tents, squatters recently returned back. Last two weeks had been quite hard for these already poor people as flood took away the little they had. Some of their homes are still waterlogged and the food materials and clothes that they had were swept away. Now, they are trying their best to bring their life back on track but the flood’s havoc still continues to haunt them every time they go to fetch water, among others. Binod pariyar, a local of Nayabasti says all the locals have been relying on the same polluted water for their survival. “We at first filter the water with a piece of cloth and then we pour it to a bucket and wait for the dirt and mud to settle down,” he said. According to him, it has been quite hard for the locals to follow this long process. What has made the situation more precarious is the outbreak of diseases. 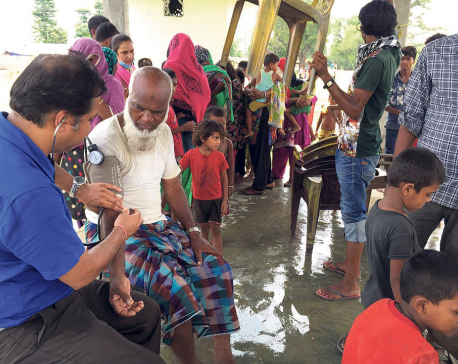 Squatters living in various parts of Banke and Bardiya are complaining that they are suffering from various water-borne diseases. Most of them are suffering with ailments related to stomach, head, eyes and skin. This has worried the locals that it might result in epidemic outbreak in the near future. In the post flood period, diarrhea, dysentery and cholera are among the common problems dealt by the slums. It is not possible to survive without water but how long will the squatters survive with this poisonous water has been a question of concern for them. It is not possible for them to buy mineral water from market when they are not even able to afford two square meals. “There is no water in some of the wells while some are full of mud,” said Range Chunara, a local of Khurkhurebasti, Barbardia. Even after knowing that this muddy water is the reason behind their deteriorating health they are forced to drink it and it’s not their choice but a compulsion. As per the locals, this is not the first time they are dealing with this problem. Every year, in monsoon they struggle for drinking clean water. Squatters have been waiting for concerned authorities to understand their misery and find out a long-term solution to it. It would be a great respite if the government could manage clean drinking water for them at least until the time water in the well is cleaned, they said. 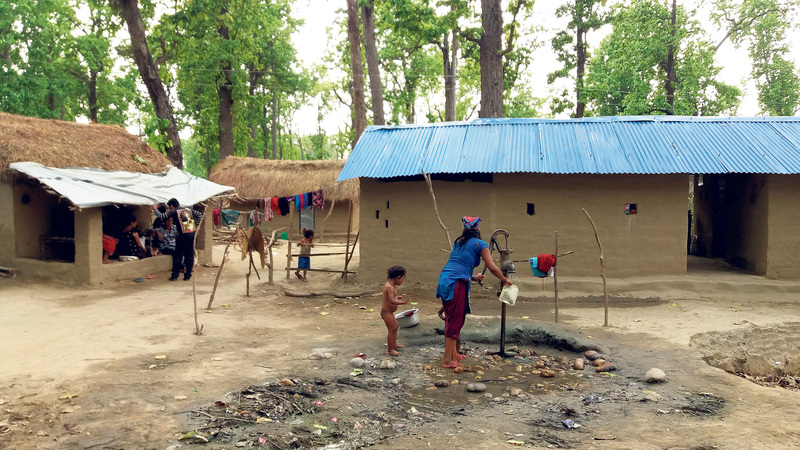 In the wake of the flood havoc, when flood victims across tarai are heading back to normal life, squatters in various parts of the country which were hardest hit by flood are still struggling for survival.